Dr. Abhay completed his MBBS in 1998 from L.T.M. Medical College, Mumbai University, Maharashtra and DORL from College of Physician & College of Surgeon, Mumbai. He completed his MS (ENT) from J.J. Hospital, Mumbai University in 2003. Dr. Abhay has been a part of several national and international conferences in order to upgrade his skills in the field of ENT. 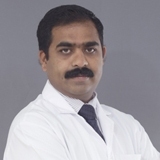 Dr Abhay has an overall clinical experience of over 12 years and is associated with NMC Healthcare for over 9 years. He has completed many professional courses to upgrade his knowledge. Dr. Abhay has special interest in Adenotonsillectomy, Grommet insertion, Ear surgeries, Micro laryngo surgeries, Sinus surgeries and Pediatric ENT.